Stay ahead by tracking economic conditions, take right decision at the right time and improve profits. With rebound in market, sentiments are soaring high and more so for commercial real estate. It’s said that 2015 and years to come will see tremendous growth in commercial real estate. The industry is on the verge of innovative disruption. However, the industry lags behind in terms of adopting advanced technology. There would be stark increase in technology investment in years to come to support the growth. 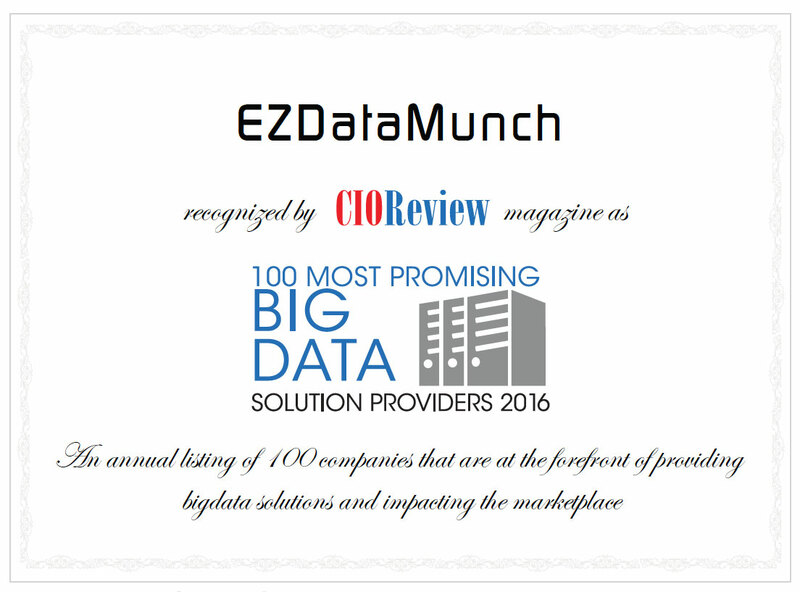 Technologies harnessing data and information are in demand. Current disparate systems are old and lacks transparency. Leaders need real time information to make accurate decisions. This information is stored in silos in multiple systems and traditional methods of collecting and reporting are time consuming and manual and error prone. We provide real estate business intelligence dashboards for commercial leasing. These pre built dashboards gives real time easy to understand graphical insight in company’s transactional data. Our solutions can be extended to any system to collect data and interpret it and make sense out of it. Leaders can access critical information on the go and make data driven decisions. In current fast paced and improving markets, executives need quick and real time reports. As commercial real estate markets are improving the number of projects has increased. This means multiple project locations and more travel. Executives need a comprehensive report that can be viewed anywhere anytime on any device with just a click. 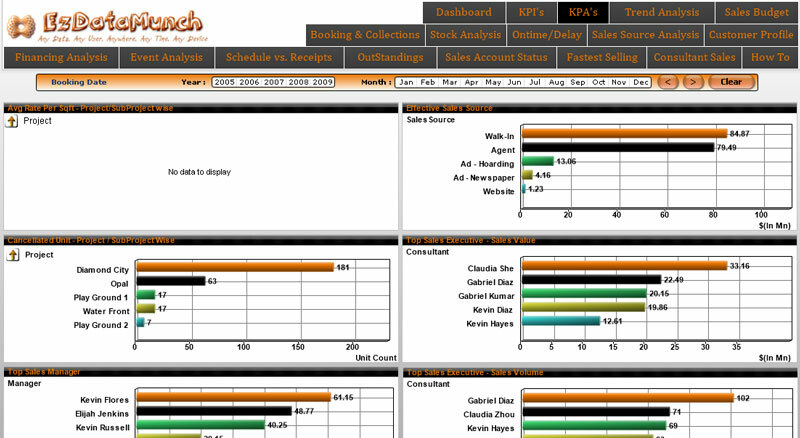 Get a high level view of all the relevant KPI’s and KPA’s on the fly. KPI’s can be filtered as desired. 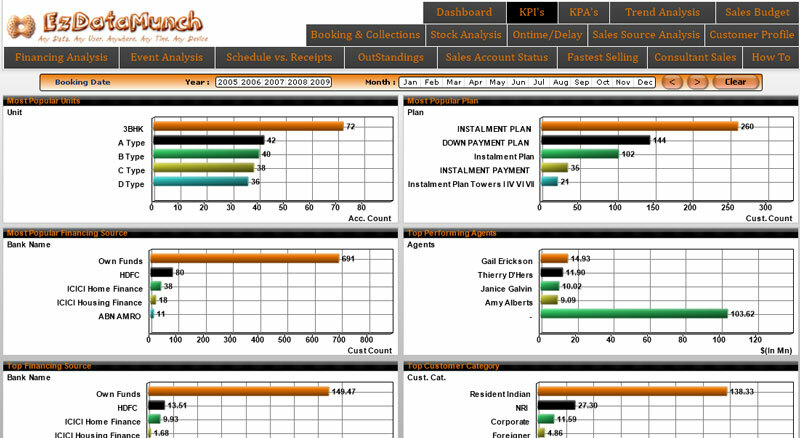 Like in this dashboard KPI’s such as most popular unit, plan, financing source, top performing agents, customer type and more are selected. KPI’s can be drilled down further to get more specific and targeted details. KPA’s dashboard showcases metrics such as average rate per sq feet that can be drilled as per project. Cancelled unit that can be drilled as per project and subproject. Effective sales source such as walk-in, through agent and website and other marketing source. Sales managers performance and score card and executive performance and score card. Decision makers are always on the look out to have detailed sales report. This report helps to assess staff performance, calculate ROI on marketing channels and keep a check on inventory. Get end-to-end real time details in sales activities with just a click. 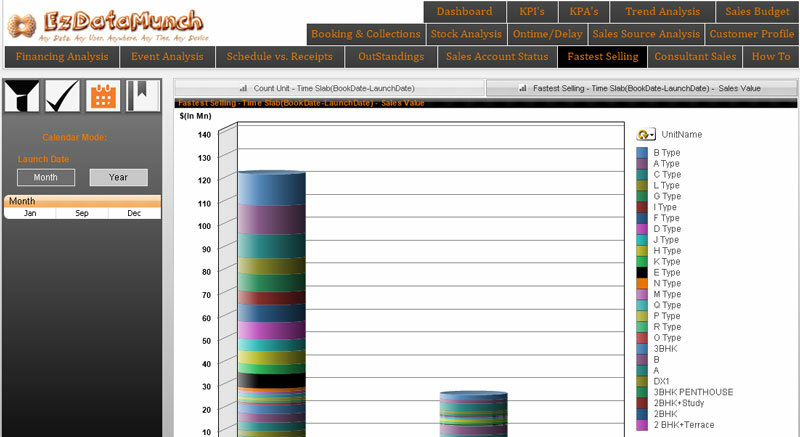 Sales dashboard gives you the option to select the booking date and drill down in the report. Pie charts represent sales details. 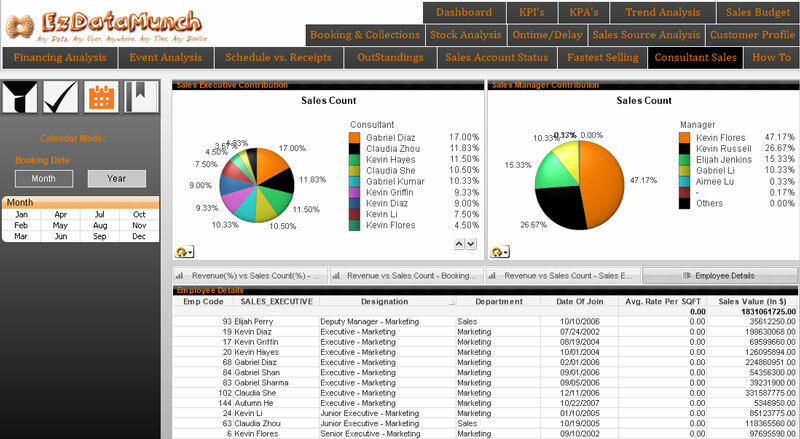 Sales count achieved by executives and managers can be viewed in terms of percentage. Detailed report as per every employee can be viewed. This report has information such as name, designation, department, date of joining and sales value. Managers can view details of units being sold. This detail has information such as fastest selling units per location. Check sales source to understand sales trends. See where the bookings are coming from and agent wise data such as agent sales and discounts and commissions. Managers thrive hard to get real time transactional details such as units booked, in stock and collection amount. Detailed information regarding these factors can help managers to plan further steps to increase sales and investment in marketing channels. Get high level view of booking and collections process. Managers have options such as bookings vs collections, average sales value and amount received. This report can be filtered as per projects. 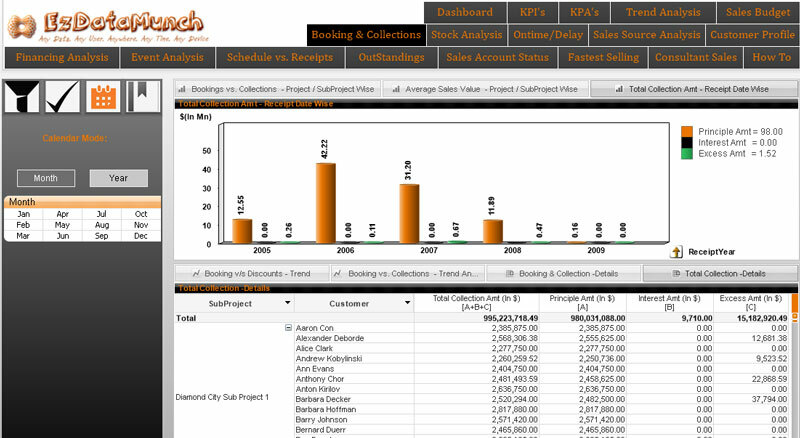 Trends such as booking vs discounts and booking vs collections can be viewed. This data can be compared with total collections to track differences. Drill down as per project, customer, total collection amount, principal amount and excess amount. Check stock status and ascertain total value of units. 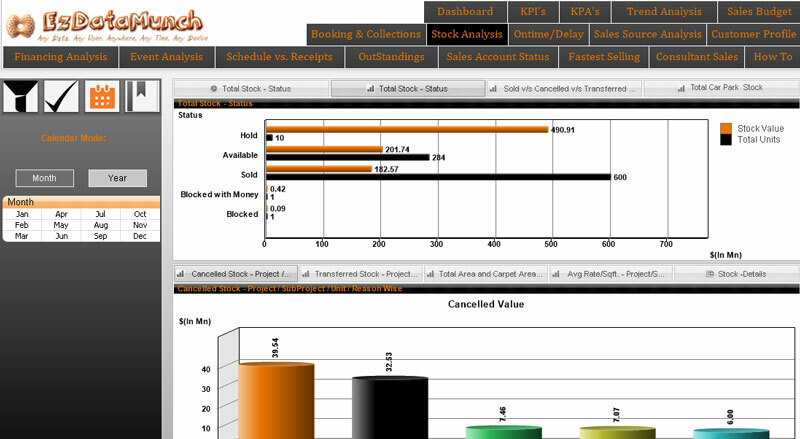 View status such as units on hold, sold, available and cancelled. Get total value of cancelled units.